In 2010, Tyler Perry found himself the center of controversy yet again, this time over his film For Colored Girls. A number of people suggested Perry, best known for donning wig and dress to perform a caricature of a sassy black woman, might not be qualified to adapt Ntozake Shange’s 1975 play for colored girls who have considered suicide/ when the rainbow is enuf, a landmark work of African-American feminist theatre. So Perry did what any filmmaker would do in that situation: he went on TV to get Oprah’s blessing. It seemed to work. The controversy died down, the movie opened to Perry’s usual mixture of faint praise and scathing notices, and the whole affair was forgotten in a matter of days. If anyone could sympathize with Perry, it’s Steven Spielberg. In 1985, he was in a similar spot over his adaptation of Alice Walker’s Pulitzer Prize-winning novel, The Color Purple. But while there was certainly concern over whether or not a nice white Jewish boy from Southern California could take on this story, there were also more general questions raised about his ability as a filmmaker. No one doubted his skill at crafting thrilling boys’ adventure stories featuring sharks, UFOs, and Nazi-fighting archeologists. But this movie was actually supposed to be… you know, about something. Was he up to the challenge? Spielberg also had Oprah in his corner but not as the Queen of All Media she would become. At this point, her sphere of influence only went as far as the greater Chicago area, which is where co-producer Quincy Jones saw her and persuaded Spielberg to give her a shot. It was a smart move. She really is terrific in the movie. Too bad about the TV thing. She could have been a first-class character actress. The movie helped her, too. Oprah’s talk show star was already on the rise but that Oscar nomination certainly didn’t hurt when it went into national syndication in 1986. When the movie was finally released, it was predictably met with protests from organizations such as the NAACP, who complained about perceived stereotypes as well as Spielberg’s involvement. But when the Oscar nominations were announced, two movies dominated: Out Of Africa and The Color Purple. There was one big omission, however. Spielberg himself was left out of the best director race. Did the Academy get it wrong? Personally, I think The Color Purple is a better film than that year’s winner, Out Of Africa. But it still didn’t necessarily deserve to win. (For the record, my own choice for the best picture of 1985, Terry Gilliam’s Brazil, wasn’t even nominated in the category.) Spielberg has never been a particularly subtle filmmaker. His tendency to go big when a quieter moment might be more powerful occasionally works against the film, especially when it comes to moments of comic relief. There’s a recurring gag with Harpo falling through a roof he’s trying to repair that’s especially cartoonish and out of place. Still, Spielberg and his cast make it easy to engage emotionally with these characters. If you do that, it’s possible to overlook the film’s weaker, schmaltzier elements. The Color Purple is rarely mentioned in current discussions of Spielberg’s work. It’s been overshadowed both by the long reach of his early classics and later films that did win, such as Schindler’s List and Saving Private Ryan, but it remains a key film in his career. Spielberg has referred to it as his first mature film, a characterization I don’t necessarily agree with. Many of his earlier films have deeply moving and even profound moments, especially Close Encounters Of The Third Kind, but the success of The Color Purple gave Spielberg the confidence to move beyond what most people consider popcorn movies, even if he didn’t have a little gold statue to prove it. 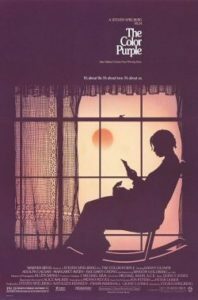 The Color Purple is available on Blu-ray and DVD from Warner Home Video.